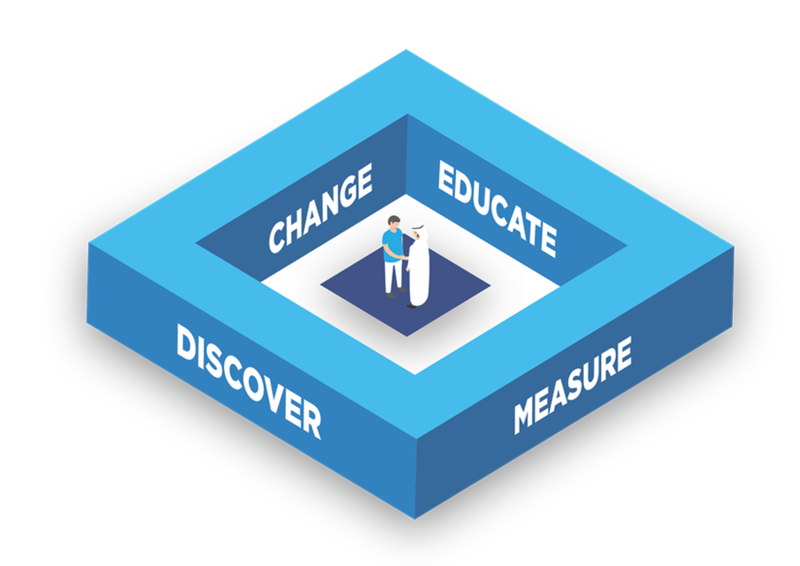 The Happiness Agenda will measure and impact people’s happiness through an iterative framework to discover, change, educate and measure people’s happiness. Our framework is built following a collaborative process to discover, imagine and plan for a future Dubai that prioritises happiness as a primary objective of Dubai’s ongoing smart transformation. Led by the Smart Dubai Office, who is also overseeing Dubai’s citywide transformation to a smart city, the Happiness Agenda will benefit from access to innovative technology and a broad partnership network for a unified approach utilising the best tools at our disposal. UAE is ranked 20th in the World Happiness Report for 2012 - 2014. According to the report, happiness in Dubai has increased by 2.5% since 2005. We are confident that we have the right mix of city leadership, partners and innovators to substantially increase and sustain happiness in Dubai. We will build on the legacy of our city’s leadership, who have continuously prioritised people’s happiness. We are already a benchmark city for happiness: with the Happiness Agenda, we will create a blueprint for our sister cities to follow. Today, city leaders and decision makers act from an informal knowledge base with assumptions about what factors influence happiness in the city. We will build a unified definition of happiness, beginning with a scientifically aligned cultural baseline and understanding of basic and higher needs in Dubai. This formally defined, shared understanding, will become a guide for strategic activities in Dubai to prioritise happiness. Without a shared understanding of happiness factors in the city today, neither the private nor the public sector are able to fully consider the impact on happiness from city planning and customer experiences. Building on a culturally relevant scientific model, we will define and promote new policies and approaches to focus the city and its people on happiness. Both city leaders and individuals can benefit from a deeper understanding of personal happiness factors and how to control them. To achieve a deep organisational and personal understanding of happiness factors across the city, the Happiness Agenda will put forward a collection of events, content and training programs to build awareness, teach self-reflection and influence the city. Happiness is a choice. We are helping our city make the choice to lead a happier life. Supported by a multidisciplinary partnership network and influential thought leaders, we are helping to create a cultural shift to happiness for the city. The Happiness Agenda will pursue an objective, scientific approach to influencing happiness for the whole city. With a dedicated focus to measuring people’s happiness, our teams are continually researching and refining a scientific model for city happiness that is informed by city data. We are developing a live, target-driven measurement tool to monitor satisfaction and happiness levels for the the whole city. Big data insights are not limited to the technology sector. By implementing customer satisfaction and sentiment analysis tools for the whole city, the Happiness Agenda will empower decision makers to act for people’ happiness in real-time, supported by data. Our question isn’t what does it mean to be happy — rather we ask, what do we need to be happy? The Happiness Agenda aims to address the needs of people that are essential to enhancing happiness for both the short and long term. The Happiness Agenda will discover these needs, create changes that support them, create awareness so that others can support them proactively, and innovate towards ‘happiness’ by satisfying individuals affective, emotional, basic, cognitive and deeper eudaemonic needs. According to the hierarchy of needs (Maslow, 1954), basic needs must be satisfied before higher needs are satisfied. One approach is to opt for addressing basic needs first, then higher needs. However, a mix is the better option. Provision for basic needs will have an immediate, pragmatic and tangible value for customers. Good customer experience design, as an example, can reduce stress for customers while delivering essential services efficiently easily. Higher needs, on the other hand, will tend to have more long-term psychological value, as illustrated by the field of Positive Psychology (Seligman & Csikszentmihalyi, 2000), where the focus is on well-being and pleasure (Tiger, 1992). The accepted ‘formula’ for Subjective Well Being, which studies how people experience the quality of their life, encompass both an individual’s sustained sense of satisfaction with their lives, as well as emotional states over time. However, this equation does not make reference to Basic needs, nor the deeper and more profound Eudaimonic needs, which are more about higher meaning and purpose. Therefore, rather than just addressing basic needs, attending to all the above needs in parallel will yield a better experience for people. The Happiness Agenda aims to increase ‘Happiness’ by satisfying all needs towards a more complete and holistic positive experience. People need opportunities to be happy in the moment. We are focusing on making those moments possible. An individual’s affective, or emotional response to a stimulus, determines how they will react to a situation. Affect is an evaluative system which will lead to an approach-avoidance response (Norman 2003, p. 20). Affect is one component of Subjective Well Being, allowing a person to experience positive emotions. To satisfy individual’s affective needs, the Happiness Agenda will seek to provide opportunities that lead to positive emotions & feelings such as fun, joy, and other pleasures. Satisfying people’s basic service needs is the first duty of a city. Happiness and well-being must build from there. Living in a city, people have a lot of basic needs regarding services. From water and electricity, to easy access to food, to reliable transportation, to healthcare and an internet connection. At the most elemental level, people need to know that the service is available, and how to access it. By extension, people need a service that is efficient, convenient, and easy to use. Even greater value is derived from services that are personal, automatic or transparent. Further positive value may be derived by a reduction in cost of time and money. Satisfying individual’s basic needs provides the platform on which people can stretch a higher frequency of positive emotions and sustained emotional well-being. The Happiness Agenda seeks to meet people’s basic needs by providing people the ability to access services in an easy, efficient, convenient and seamless way. People who are satisfied with their quality of life are more likely to feel positive in new situations. Subjective Well-Being (SWB) is equated to the sum of Affective & Cognitive needs (OECD, 2013), and cognition is a process that is related to assessment, and is for interpretation and understanding. With respect to Well-being, this can be related, for example, to a person’s assessment of their ‘Satisfaction with Life’ (Diener, Emmons, Larson, & Griffin, 1985). Helping people make positive assessment of their lives in important domains; for example work, health, family, housing & income, can lead to improved overall perception of well-being. The Happiness Agenda therefore seeks to help people achieve a high sense of well-being and satisfaction with their lives, in turn enhancing individuals long-term and short-term happiness. People’s desire to achieve a sense of meaning and purpose in life is a driving force for sustained happiness. Aside from functional needs, people also have needs associated with deeper meaning and purpose in life (Csikszentmihalyi & Rochberg-Halton, 1981). Individuals who have discovered their own sense of meaning and purpose and more likely to experience a state of ‘flow,’ characterised by intense and joyous focus on a particular task, to the exclusion of all other needs. (Csikszentmihalyi, 1990). Such needs may also be related to people actualising their “daimon” (true self) (Vitterso, 2003), also known as Eudaimonic needs (Huta, 2014). The Happiness Agenda will aim to support people in engaging and meaningful activities that maximize their sense of purpose and pleasure. Our agenda spans 4 strategic portfolios, and 16 programs. Discover basic & higher needs, formalise definitions & establish a cultural baseline. A primary portfolio in the Happiness Agenda is the ‘Discover’ portfolio, which is geared towards ensuring clear and shared understanding amongst stakeholders. The essence of this portfolio is to discover rather than assume facts and concepts that lie at the heart of subsequent activities. This will result in enhancing the efficiency and chances of success of these activities. Agree operational definitions to be used in the Happiness Agenda. Projects will also collect data, e.g. demographics, to help with segmentation, needs assessments, customer values, & trends. These data will then be shared, ensuring data re-use and collaboration. Collaborate & partner with academia, to link with the Happiness and Positive Psychology community, to position SDO as a thought and practice leader, and to transfer knowledge to SDO/Dubai, as well as being able to develop and implement leading ideas locally. Some activities will include setup of academic-grade studies (e.g. longitudinal studies) to measure impact of interventions, in order to be able to enhance the HX strategy & plan. A key program within the ‘Discover’ portfolio is the ‘Alignment’ program. The reason is so that SDO ensures citywide efficiency of resource expenditure, as well as coherence from both organisational views, as well as from a customer experience view. Such alignment will enhance city and people’s happiness. This is the portfolio that is primarily responsible for creating change in Dubai with regards to Happiness. This change will be made by having a clear strategy towards HX (Happiness Experience), as well as producing policies and associated awards that encourage activities and services that enhance happiness. The portfolio also contains programs aimed at delivering customer interventions as well as city transformations that improve the quality of life in Dubai. Influence policies & recommend approaches to focus city and people on happiness. A primary function of the Happiness Agenda will be to develop an academically sound ‘Happiness Experience’ (HX) strategy, designed to guide policy-makers, government and private sector leadership to consider the impact on happiness to their constituents (government, business, individual) from new policies, programs and projects. The HX strategy will further define a roadmap of policies and programs to ensure the leadership are equipped with the right tools and support structure to implement the strategy at a wide scale.The HX strategy will be centred on a scientifically sound decision-making tool enabling decision making to estimate the predicted happiness impact on constituents from proposed new projects. The HX decision-making tool will be designed to be functional across all smart city dimensions: economy, living, governance, mobility, environment and people. Smart Dubai is leading a citywide transformation through smart technology to create a more seamless, safe, efficient and impactful experience for the city. This city-wide effort is guided by City Transformation Agenda, which defines Smart Dubai’s strategy to make Dubai the happiest city on earth through technology innovation. The Happiness Agenda directly contributes to the City Transformation Agenda, ensuring the maximum possible impact for customer happiness throughout the city. This program will ensure ongoing alignment, measurement and reporting of the Happiness Agenda in line with the City Transformation Agenda. The Happiness Experience strategy will be articulated through a collection of policies and award programs designed to bring about wide-scale adoption of the HX strategy by the public and private sector. Specific customer interventions will be designed and tested for impact and ability to scale across segments. Build awareness, teach self-reflection and influence city to prioritise happiness. An important part of increasing happiness in Dubai is to create awareness, train and educate customers and organisation with regards to happiness activities and its culture. This will be done by disseminating relevant content and delivering events that promote such understanding. Such activities will be undertaken with partners in various sectors, as well as positioning Dubai as an international thought leader in the science and practice of happiness. The effectiveness of the Happiness Agenda will depend on the strength of local knowledge capital for happiness. An in-depth training and mentorship program will be developed and executed in parallel with the Happiness Experience policies to equip government, private sector and individual leaders with the skills and expertise to execute on the Happiness Agenda. The Happiness Agenda will produce public events and interventions in the form of ‘Happiness Labs’ together with content publication across print and digital ‘Happiness Channels’ to increase public understanding of happiness factors. Open engagement channels with the public and stakeholders will also be managed. 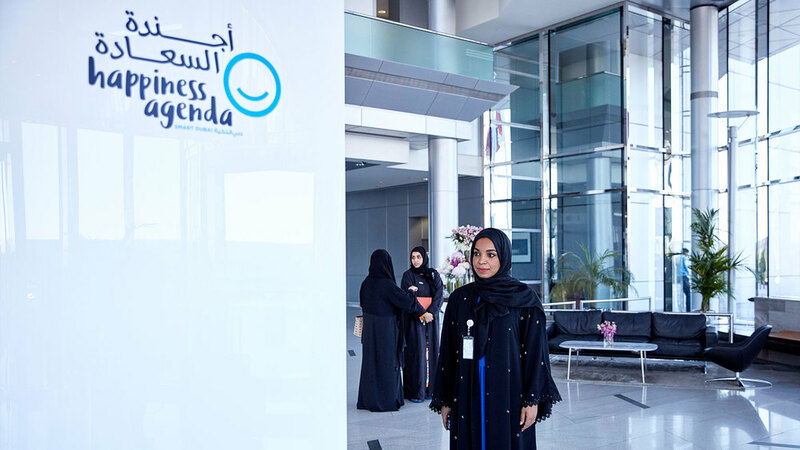 Continuing Smart Dubai’s commitment to collaborative partnerships, the Happiness Agenda will introduce “Happiness Partners” from government entities and the private sector to support the implementation of the Happiness Agenda. Happiness Partners will contribute or take responsibility for projects in the Happiness Agenda portfolio, according to their areas of expertise and respective mandates. Key strategic partnerships will also be developed with local and international academic institutions and the media to support the Happiness Agenda. Dubai seeks to establish itself as a global thought leader in city transformation for people’s happiness. A thought leadership program to invite and grow a global leader network; support local through leaders; and celebrate entity-level ‘Happiness Gurus’ will bolster the network of happiness influencers in Dubai; elevate Dubai as a global case study; and make Dubai a destination for happiness scholars. Research, formulate and implement a happiness impact decision making tool & city wide index. In order to ensure efficient and efficacious delivery of programs within the Happiness Agenda, it is important to sustain ongoing measurements of key aspects of happiness and customer needs in private and public sectors. We will conduct regular assessments of happiness in Dubai, as well as assessing the effectiveness of the framework within the agenda itself. One of the factors that need to be taken into account when measuring happiness is ‘adaptation’. This is the factor that as adoption increases, people are initially happy and satisfied, but these feelings decrease as the service becomes routine. A steady stream of new services and upgrades are required to sustain high levels of satisfaction and happiness. Therefore, the Happiness Agenda is by definition, dealing with moving targets, and measurements of happiness must take this into account. A key program in the ‘Measure’ portfolio, is this one which is concerned with finding, on an on going basis, what the specific customer needs are for the primary segments, especially related to ones that were identified in previous engagements. Such engagements will involve various research methods such as interviews, assessments, workshops & surveys. Analyse & review government operated smart channels. Analyse & re-design interventions & change framework. OUR VISION IS TO MAKE DUBAI THE HAPPIEST CITY ON EARTH. We are looking at creating meaningful partnerships with local and global organisations to learn from, and to share our findings along the way.